First World War German Field Gun at Bunters. The story began when I (in my capacity as a Heytesbury Parish Councillor) was tasked with taking an Inventory of all the benches in our Parish for the Parish Asset Register. Most benches are very easy to record as they have brass plaques with a dedication either in memory of a person or in commemoration of an event. on Wednesday 21st February 2018. I was, however, a little stumped by the black-painted, long, wrought-iron bench on the grassy area opposite the corner of St. John's Hospital. An elderly village resident remembers it as having been there all her life and suggested to me that it might have been put there for Queen Victoria's Diamond Jubilee as a commemorative bench. It has always been known to her as 'The Jubilee Bench'. (Sadly, the design and style of the bench are not quite old enough to allow that I'm afraid) - and anyway the real story that I am uncovering is far more intriguing. The gun in the picture above came to Heytesbury from the 6th Earl of Radnor, via his cousin Nancy Pleydell Bouverie who lived at Bunters in Heytesbury from 1923 until she died in 1976. (She and her sister are both buried in Heytesbury Churchyard). Incidentally, Nancy and two other of Anthony Wilson's cousins (Margaret Makgill Crighton Maitland and Esther Makgill Crighton Maitland who owned Knook Manor at the time) actually PAID £150 for the Raymond Hall, Heytesbury, in the conveyance dated 7th December 1935, so we all owe them rather a debt? The Earl of Radnor was probably rather too old to have fought in the First World War himself* but I guess that I could research him and his career through army records? So how did he get his hands on this booty of war? Between the two of them, they decided to mount the gun on the site where the wrought iron bench stands today and once there it was to act as our War Memorial to those from the village who had died fighting in The Great War. 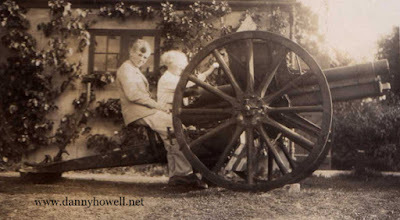 This field gun therefore became Heytesbury's First World War Memorial and was maybe there for two or three years before our present War Memorial in the churchyard was erected in 1921. I am hoping to research that monument too (now Grade 2 listed)- as nobody really seems to know whether the Church owns it (it stands on Church land, of course) or whether Heytesbury Parish Council own it and must insure it and maintain it as a part of the Parish Asset Register. When Siegfried Sasson bought Heytesbury House in 1933 he was definitely not at all enamoured of anything German. In 1935 he suggested that if the village agreed, the German Field Gun should be removed and that he would replace it with something rather less Germanic at his own personal expense. So, the Sassoon bench was bought and apparently installed to commemorate the Silver Jubilee of George V which occurred in 1935. (The King died the very next year, in January 1936). And, the gun was removed to the garden of Bunters where the picture above of Nancy and her nephew was taken, and there it remained for many years. No-one, at the moment, appears to know where the gun eventually went. How was it that the First World War connection was so easily written off the corner site? Of course the traditional War Memorial had been erected in the corner of Heytesbury Churchyard for 14 years by the time the gun was removed from opposite St. John's Hospital to Bunters. I shall have to find out more. Might you know anything about our War Memorial by the Church in Heytesbury and anything about the men who are commemorated on it? Thank you Trish for your interesting and intriguing story. To answer your question about the War Memorial in Heytesbury Churchyard and your request for information about the men commemorated upon it, rather than write the facts again here or repeat the biographies, I would suggest you acquire a copy of the book '1914 - When The Call Came' which was compiled by Heytesbury C of E Aided Primary School. This was the children's Heytesbury and Norton Bavant War Memorial Project and formed part of the Wylye Valley 1914 Commemoration Project. 1914 - When The Call Came. This superb book will tell you not only about the lives of the men commemorated on the memorials at Heytesbury and Norton Bavant (the remit of the project also featured recording details for the men who returned from the War); but also the background (featuring newspaper cuttings) with regard the erection of the War Memorial at Heytesbury Churchyard in 1921. If you can't source a copy of the book for yourself, then Warminster Library has a lending copy. I have one too in my own personal collection. With regard your comment that the 6th Earl Of Radnor "was probably rather too old to have fought in the First World War" if you 'google' him you will soon find that Jacob Pleydell-Bouverie, 6th Earl of Radnor, CIE, CBE, (1868 - 1930), who was Viscount Folkestone from 1889 to 1900, was a Lieutenant Colonel (and a Brevet Colonel) commanding the 4th Battalion of the Wiltshire Regiment, serving in India from 1914 to 1917. As to the demise of the First World War German Field Gun which was removed to Bunters, whenever I mentioned it to any Heytesbury villagers, they all seemed to suggest that it may have been cut up for scrap either for recycling for munitions as part of the war effort during the Second World War, or that it may have gone for scrap or was sold at a later date, but no one had any printed record of it. No-one seemed sure. Perhaps some new research will provide the answer. To that end, if any readers of dannyhowell.net have any memories of the gun or information as to what became of it, perhaps they will get in touch and let us know.